No matter how many times I do it, the commute from Northern New Jersey into Brooklyn never gets any more enjoyable, nor does it ever get more timely. The weekend bus crawls through the intersections of suburban towns, and undoubtedly gets held up around the mouth of the Lincoln Tunnel. Once I get into the city, I go elbow to elbow with dozens of other people to cram into the only subway cars not beset by some sort of track repair. Then, I stand and long for some semblance of personal space until I finally reach my stop. No, the ride into NYC is never a glamorous one- but it always proves to be a rewarding one. Especially when you meet the colorful personalities that make up the city’s skateboarding contingency once you get to your destination at last. 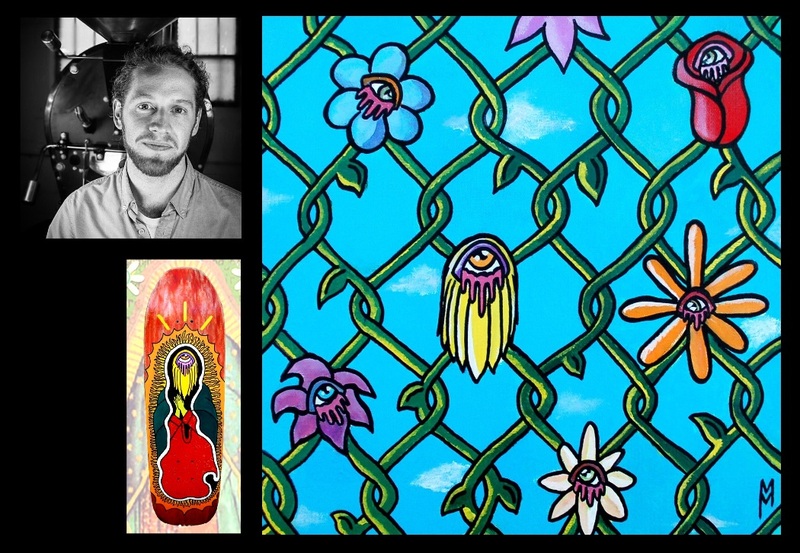 Clockwise from top left: Maximilian Mueller portrait by Brian Lentini; “We’re All Intertwined” by Maximilian; “Pray For Nature” hand painted deck by Maximilian. On this day in particular, I made my way out to Bushwick and found myself in familiar territory of interviews I had done in the past. With the last few hours of sunlight remaining, I made my way through streets of people savoring the above-freezing temperatures and found an unassuming door somewhere between a flower shop and a barber shop. Inside, one of New York skateboarding’s most decorated up-and-coming artists, Maximilian Mueller, welcomed me in to check out his spot. As we stepped in the front door, we were immediately in his work space, complete with decks lining the walls and wheels piled up on the window sill. Scattered around were finished and in progress works of some of his more iconic subjects. Most notably, his “Peeking Face” graphics seemed to be staring at us from all angles. Mueller told me this graphic, which is considered his trademark, was born in 2007, and was originally created to take the form of an African mask. However, in chopping off the lower half of the figure’s face, he found it far more interesting to view the figure as emotionless, only partially being able to communicate with the direction of the figure’s eyes. At the same time, one of his other well known characters, “Wilty” (a crying flower) looked down upon us as well. This one, Mueller told me, was also developed around 2007, but became more meaningful to him in accordance with his eventual departure from his rural home of Maryland to the concrete metropolis of New York to pay homage to the aspects of nature he felt that he was losing around him. Before it got completely dark, I jumped at Mueller’s offer to check out the roof of his building. After scaling a rather precarious ladder to get ourselves up there, we found ourselves among the pigeons and satellite dishes, and had a seat with a Montauk Driftwood Ale in hand. The views from above were nothing short of incredible as we overlooked a few skaters sessioning the perfect iron angled stage ledge at Maria Hernandez Park across the street from the building. 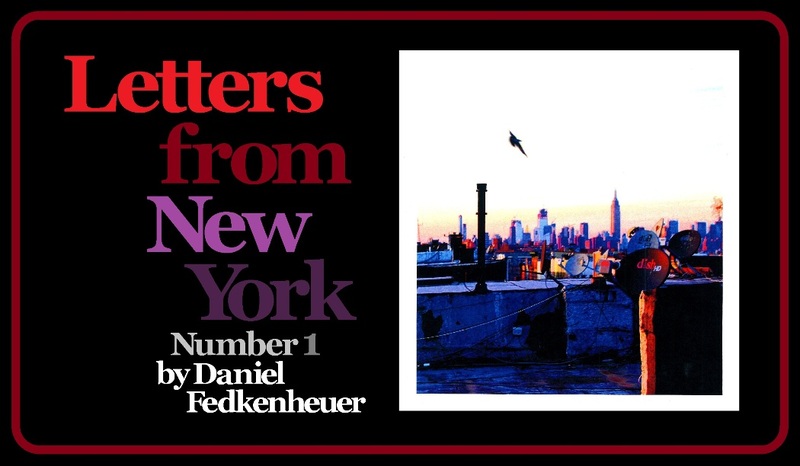 Although, not even the sight of skaters setting up for their tricks across a perfectly smooth tiled ground could compare to the sight of a golden sun setting over the Manhattan skyline dead ahead. Our subject, Maximilian Mueller backside 50-50, photo by Rob Wallace. After nearly freezing outside, we settled in downstairs, took a step back, and started chatting about his roots growing up just outside of Washington DC. In 2000, he told me, he began skating at age 7 when he snatched his brother’s Element board that a friend had passed along. As he progressed on the board, he would come to realize the lack of parks Maryland had to offer, and he set his sights on the nearby city instead. Commuting into the urban playground using the same Metro red line that Bobby Worrest frequented, Mueller found his way to the mecca of Washington DC skateboarding – Pulaski Park (aka: Freedom Plaza). However, as is notorious with the spot, the heavenly assortment of stone ledges and stairs was habitually surrounded by cops. As such, Mueller remembers countless times where his sessions would be compromised by the presence of police, forcing an every-man-for-himself escape from the park. Though Mueller managed to avoid getting caught and jailed for skating there, it was episodes like these that made it seem to him like all skateboarding was illegal growing up. As for his beginnings in art, he fought to avoid the cliché of saying he had been doing it for as long as he could remember. Of course though, the truth is that Mueller has been drawing and painting since his childhood, and even documented that he wanted to be an artist in his third grade yearbook. As his schooling career went on, Mueller proclaimed that he wanted to take art seriously (by way of making a career out of it) in the 9th grade. At the time, he recalled the skepticism of his professors and stood by the fact that those who challenged his work the most, ended up becoming the figures that made the biggest impact on his pursuit. Eventually, Mueller explained how he was starting to see what he thought was the end of potential in rural Maryland. In response, he set his sights north and made his move to New York City. By late 2014, Mueller got linked up with Alex Corporan of NY Skateboarding to start designing flyers for the popular, SkateNight NYC events, formerly at the Leftfield Bar in the Lower East Side. Surrounded by some of the foremost players in the 80’s and 90’s skate scene, Mueller began to see the value of interacting with and learning from the insights of those skating years before he ever stepped foot on a board. In the same way that the attendees showed their commitment to skateboarding, Mueller begun to build a portfolio dedicated to both the skateboarding and art communities alike. Supported by Corporan the whole time, he was reminded that the work he put into the flyers was earning him more respect than he was aware of. As Mueller recollected some of these early works, he stands by the notion that he was doing the right things for the right reasons. In the end he realized the importance of not only being involved in the scene, but contributing to it. Left to right: Maximilian astride a Street Plant “Wilty” graphic deck; “Lowrider” by Maximilian; “Peeking Totem” hand painted deck by Maximilian. Before long, as Mueller told me, his perseverance would pay off by the end of 2015. In the fashion of a true Christmas miracle, Mueller told me the story of getting an email response from the ever-engaging personality of Mike Vallely on Christmas Day. 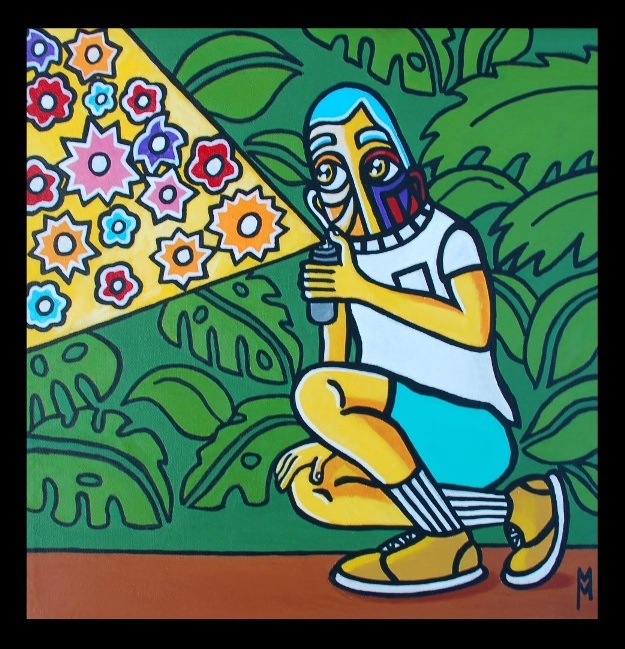 Upon seeing artwork that Mueller had sent him, Mike had him start doing illustrations to accompany some of his poems and writings, and soon after recruited Max to join Street Plant Brand’s Battalion as a member of the art team. 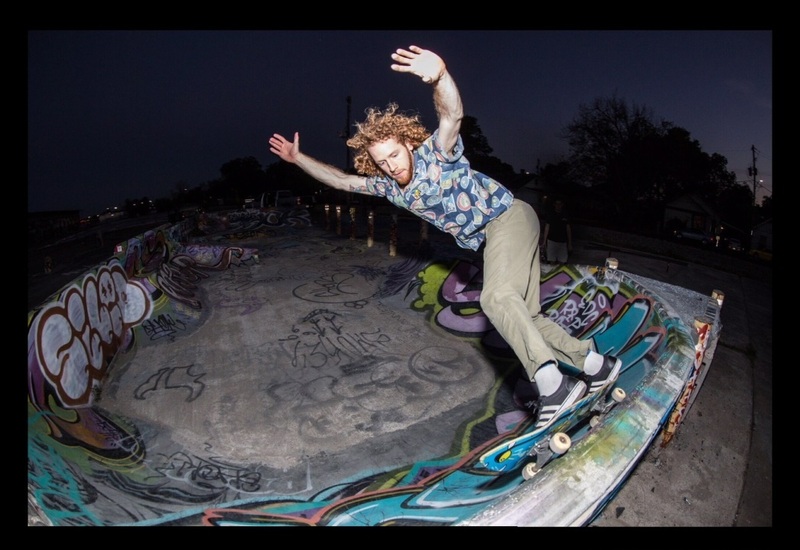 Some of his recent work with Vallely’s brand has also included a tour through Texas with the team and even a run of boards with Mueller’s Wilty graphic hitting the streets. With his work starting to facilitate throughout the world of skate-centric art, Mueller would find that his connections from SkateNight NYC came back into play. Another one of the folks that Mueller cites as a key to his story, Josh Zickert from adidas Skateboarding, who was familiar with the work he devoted to the old flyers, offered him a spot at the second ever adidas Skateboarding ‘Show Case’ at the renowned SoHo Arts Club (former location) in April 2016. Inside the walls that were once Grace Jones’, and frequented by the likes of Andy Warhol, Keith Haring, Jean-Michel Basquiat, and Julian Schnabel, Mueller proudly showed his work in the second event of the ‘Show Case’ series (last in this space) that would end up traveling around the globe soon after! Later that year, Mueller explained to me, he was again summoned by adidas Skateboarding to paint some ramps for their Skate Copa Court Brooklyn event, the first event before it toured the globe. His marquee piece there was a circular manual pad, which he spent hours hand painting. Once his work was unleashed to the world, the likes of some of adidas Skateboarding’s best including Tyshawn Jones and Nakel Smith put on a clinic of technical manual tricks over his work. In Mueller’s eyes, however, his favorite bit of skating from the event was seeing the people’s champ, Mark Gonzales, playfully bumping nosepicks into the side of the piece he helped bring to life. Evidently, as I would learn, his work with adidas Skateboarding was not, and is not finished yet. Those who remember seeing the back cover of the August 2017 issue of Juxtapoz Magazine (Mueller’s all time favorite magazine) would know that the advertisement set the tone for an incredible event that took place this past December in Miami, Florida. Again, Mueller was hand-picked for a showcase, but this time with a celebrated collective of 13 other artists from around the world. In a massive show that was well attended and got significant press, the experience demonstrated to Mueller how sincerely people still respect the arts, and the passion that bring the work to fruition. As we wrapped things up, Mueller left me with a few parting words on his presence in the skateboarding and artistic worlds alike. He made clear how he was not in either community to serve as a judge for how people perceive his art (or his skating for that matter). Instead, he told me that his place in these subcultures was to surround and align himself with like-minded people within and outside the art and skateboarding communities. Unlike Mueller, my immediate future had no plans for fancy art shows and faraway skate trips. Instead, I left the apartment bound for another two hours of dingy subway cars and confined bus seats on the way back to North Jersey. However, I left reminiscing over the sights of rooftop views and the stories from one of the most passionate young skateboarders I have come across lately. And no matter how many times I do the commute, leaving with memories like that are always every bit worth it.